You might not know Doug and Mike Starn, but you’ve seen their artwork if you’ve visited the South Ferry subway station in downtown Manhattan. Their award-winning “See it Split, See it Change” installation was unveiled in 2009 and features silhouettes of trees and a marble mosaic. The Starns have been working on a new creation in their enormous studio in Beacon, NY over the past two years. Taking on a life of its own, Big Bambú has had forward momentum, according to the Starns, almost like a "slinky" progressing from one end of their 300-foot studio to the other. Recently unveiled at the Metropolitan Museum of Art, the rooftop-sited Big Bambú is the most ambitious outdoor exhibition the museum has ever installed. 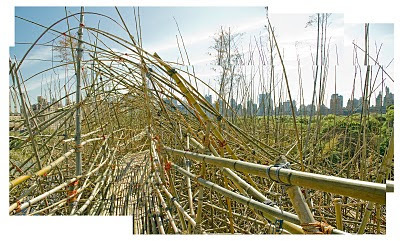 Named after an album by Cheech and Chong—the twins’ nicknames in high school— Big Bambú is an organic structure consisting of 5,000 fresh-cut bamboo poles and 50 miles of nylon rope. They chose bamboo since it is weatherproof and sturdy, yet lightweight. Big Bambú is constantly growing and changing and will eventually be in the shape of a cresting wave as the Starns and their crew of rock climbers evolve the sculpture each day until the exhibition closes. Mike Starn notes, "It will be slice of a seascape. A seascape has always been emblematic to us of something that is always the same but always different. It is always active." His brother Doug echoes these sentiments, “This piece is organic. It’s about all the things in your life, including those that aren’t planned. This artwork represents what it means to be alive: you are a complete person but that doesn't mean you are finished. You are the same person you were as a little kid, but you are also someone completely different." Wow. 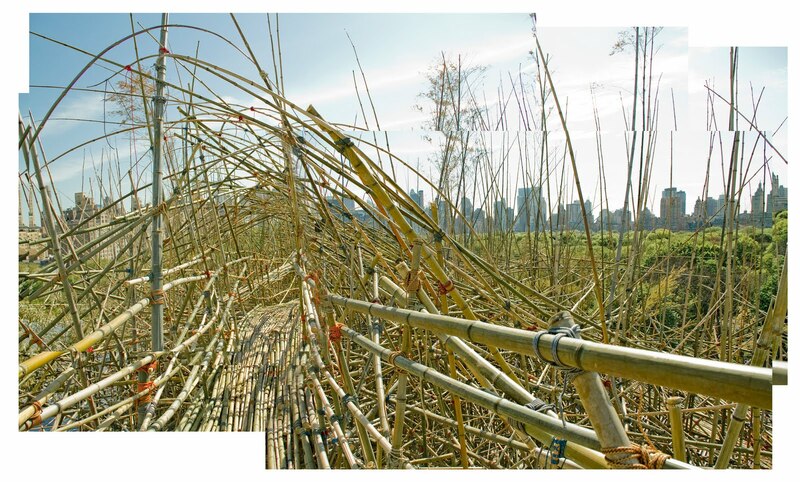 Big Bambú, which opened on April 27, is the first exhibit at the Met to allow the public’s participation. Watch the exhibit transform right from the roof garden, or venture into the depths of Big Bambú and its towers by purchasing a timed ticket, which gives you the chance to take a guided climb through the upper regions of the structure. You’ll need to wear rubber-soled shoes and no photography is allowed. Visit http://www.metmuseum.org/ for more details about this phenomenal exhibit, which closes on October 31. This sounds great, I'm going to visit. But I wonder if kids, seniors, or people with certain disabilities would have trouble with it, if they are allowed access at all? They would have access by elevator to the roof where they could view the exhibit. However, they would not be able to climb up the pathways which take a bit of agility. The exhibit is striking viewed from all perspectives.